Huaiyang cuisine, as an epitome of Jiangsu cuisine, was originated in the areas surrounding Huai’an and Yangzhou, and featured on the menu of the royal courts. Even today, most dishes served at state banquets can be identified as Huaiyang cuisine, so Huaiyang cuisine is also known as the national dish of China. 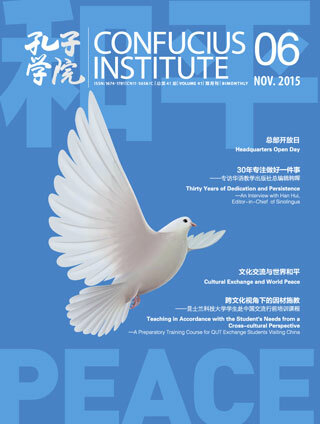 In golden autumn, Nanjing, the provincial capital of Jiangsu Province (once known as Jinling. 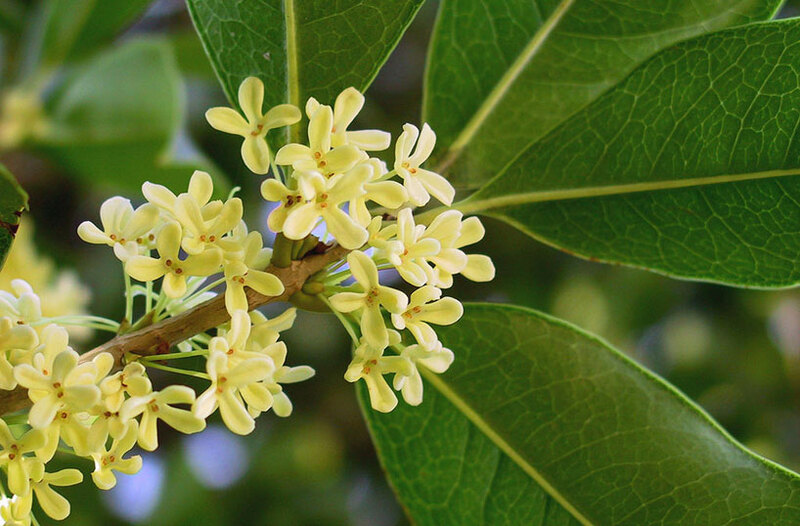 the capital of ancient China for six dynasties), is suffused with the gentle sweet scent of osmanthus blossoms. Such an inviting fragrance has been incorporated in a variety of dishes as a re­sult of the ingenuity of the people of Jiangsu. 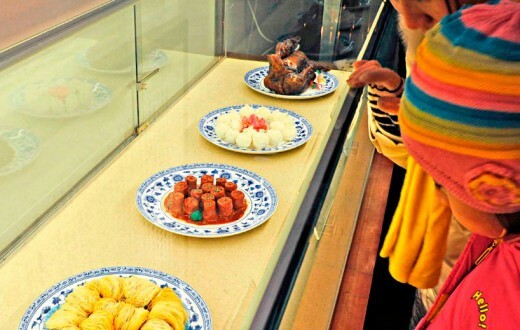 Among others, sweet dumplings in osmanthus-flavoured fermented rice, osmanthus- flavoured steamed lotus root stuffed with glutinous rice, taro in osmanthus syrup, osmanthus and lotus-root cake, and osmanthus and pine-nuts candy are all very popular. Of course, there is also osmanthus-flavoured duck, which is the favourite dish for the people of Nanjing. See how osmanthus blossoms, a tiny flower, can transform itself into such a vital and marvellous ingredient and help create so many dishes. This proves that Jiangsu is not only a beautiful coastal province, but also a gourmet paradise. The origins of all ancient civilizations can be traced back to the basin of a mighty river, so can the birth of food and drink cuiture in Jiangsu. Jiangsu cuisine established itself during the period of the Northern and Southern Dynas­ties; during the Tang and Song Dynasties economic development spurred the growth of China’s food industry; during the Ming and Qing Dynasties, the Beijing-Hangzhou Grand Canal linked northern and southern China, connecting the four famous cities at that time: Huai’an, Yangzhou, Suzhou and Hangzhou. Except for Hangzhou, all of the other three cities were located in Jiangsu Province, and the Yangtze River also ran through the city of Nanjing. Thus, Jiangsu cuisine spread rapidly via the Grand Canal and along the Yangtze River. Local cuisines, such as Huaiyang (short for Huai’an and Yangzbou) cuisine, Jinling cuisine, Suxi (short for Sumou and Wuxi) cuisine, and Xuhai (short for Xuzhou and Haizbou) cuisine, merged and blended to become Jiangsu cuisine, one of China’s four major cuisines that have come to dominate the culinary heritage of China and one of the two great pillars of “Southern Food” in China. In a sense, we are what we eat. As “a land of fish and rice”, Jiangsu is richly endowed by nature with an abundance of foodstuff, ideal for creating its superb cuisine that has enabled its people to live an easy and enjoyable life. The characteristics of Jiangsu cuisine are also similar to the temperament of the land-fresh, balanced, tolerant and patient; requiring precise knife skills and exquisite style of food presentation. As far as flavour is concerned, a single bite of the food is sufficient to conquer anyone’s taste buds. 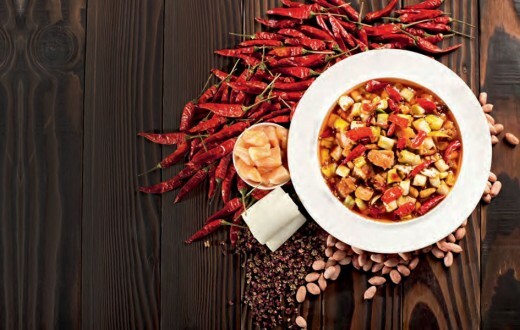 The sub-regional Huaiyang, Jinling, Suxi, and Xuhai cuisines all have their own characteristics, but as a result of historical movement of people, these cuisines have taken on each other’s traits. Let’s start with the most mouth-watering of them all, Jinling snacks. ”Lift gently, move slowly, drink the juice leisurely, and eat the wrapper lastly.” This is the knack for eating Jinling-style tangbao, or steamed soup buns. This particular type of bun tastes best when eaten straight out of the steamer as it will not taste as good when it cools down. This is because the bun filling will become dry and taste not as smooth once the wrapper absorbs the juice from the filling; moreover, the wrapper then tends to break easily and it just won’t hit the spot when the soup inside is gone. 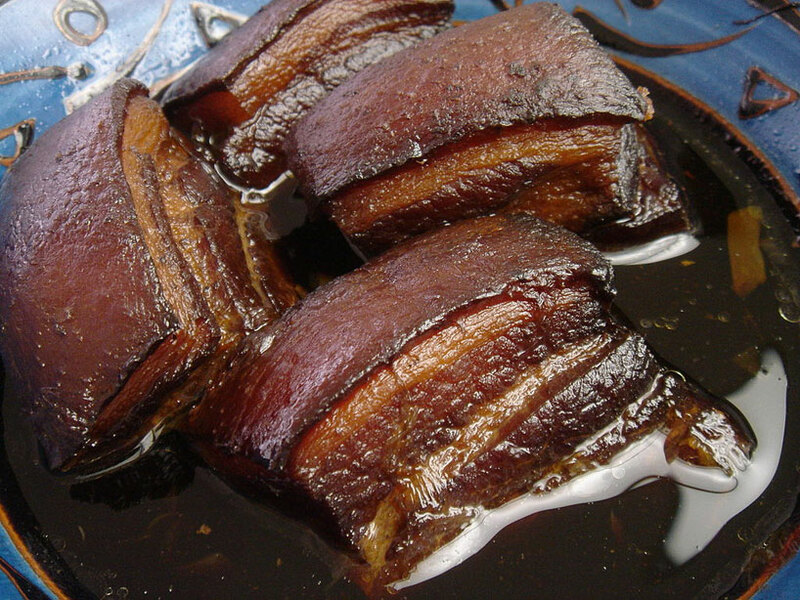 In order to make the buns juicy, it is necessary to prepare transparent meat jelly from concentrated stock. The jelly is then cut into small pieces before being mixed into the filling. When steamed, the jelly in the filling melts to make the soup bun. The perfect bun is egg-sized with a paper-thin wrapper. 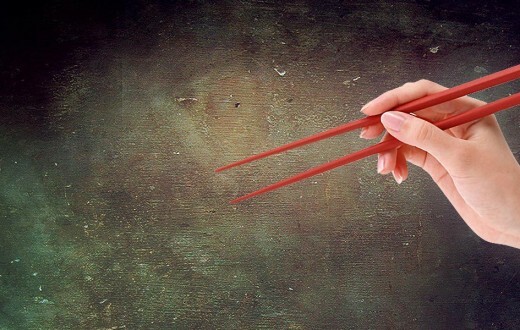 When eating a soup bun, you can lift it with your fingers or chopsticks, and place it in a vinegar saucer. Then the juice can be sipped from the bun, filling your mouth with flavour. If you don’t eat it right, the soup will spill all over your clothes. Do you want to know how refined you are? A soup bun eating test will let you find out. As the capital of Jiangsu Province, Nanjing is where snacks from around the province try to outshine each other. The Confucius Temple neighbourhood in particular is the go-to place for Nanjing snacks. Shredded dried-tofu soup, crumbly sesame-seed cake, fried beef pot-stickers, deep-fried tofu in chicken soup, plum flower pudding, sweet lotus-root porridge, etc. are all local favourites that can be eaten as main meals or as light snacks in a tea house. The shredded dried-tofu soup uses a specially prepared dried-tofu. After it is sliced and boiled in water or chicken stock, the shredded tofu can be seasoned with sesame oil, soy sauce and other ingredients to produce different varieties of soup, with such flavours as chicken, bamboo shoot and black mushroom. Among all the different varieties of sesame-seed cakes in Nanjing, Yellow Crab Shell is the most acclaimed. Shaped like a crab shell, with layers of pastry seasoned with duck/pork lard and ground pepper, this cake is thin and crispy, and smells great too. When you hear the sweet and silky call of a street vendor: “Tang zhou … ou!”, that means they are selling sweet lotus-root porridge, a favourite among children. Sweet lotus-root porridge is glutinous rice porridge mixed with brown sugar and served with thin brown slices of boiled lotus root. It is aromatic, appetising and helps to maintain one’s beauty and youth. 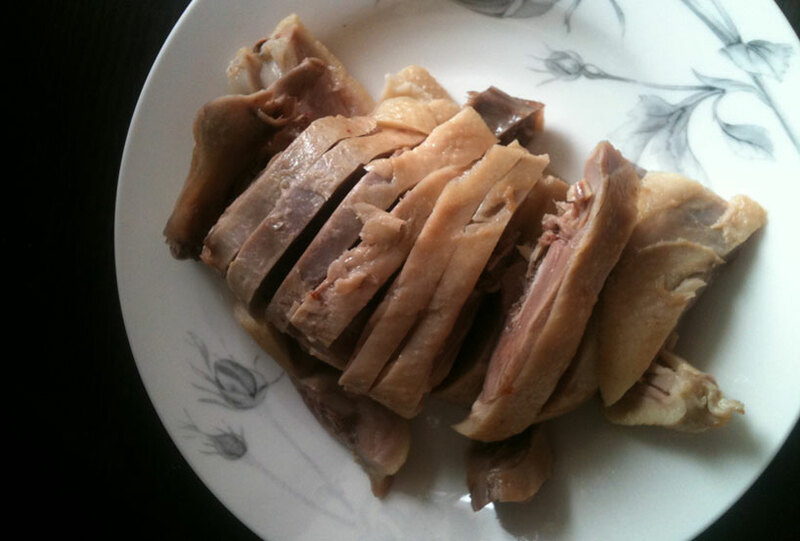 the duck is the most representative of all Nanjing specialty foods. All kinds of vacuum-packed duck gizzard snacks are sold in supermarkets, and delis found on almost every street corner will stock osmanthus-flavoured duck, roast duck, stewed duck tongue in soy sauce, etc. Undoubtedly, the duck is the most representative of all Nanjing specialty foods. All kinds of vacuum-packed duck gizzard snacks are sold in supermarkets, and delis found on almost every street corner will stock osmanthus-flavoured duck, roast duck, stewed duck tongue in soy sauce, etc. As a traditional salted meat, osmanthus- flavoured duck is the best of all salted ducks in Nanjing. Boiled salted duck has been a regional delicacy in Nanjing for more than a thousand years and can be made throughout the year. However, the salted duck tastes best when made during the osmanthus blossom season. That is why it is called osmanthus-flavoured duck, for you can taste the sweet scent of osmanthus blossoms in the delicately flavoured duck meat. Duck blood vermicelli soup is also a famous local snack in Nanjing. Duck bones are first stewed on low heat to make a soup, then duck blood, intestines and liver, and vermicelli arc added to the soup. It can be further embellished by a handful of green coriander to complement the cream-coloured soup, adding to the fresh aromas. This is typical Jiangsu cuisine: fresh and delicious, aromatic and tender, with well-balanced flavours and hints of sweetness in an otherwise savoury dish. After trying Jinling snacks, many people exclaim: “Jinling snacks are worth dying for!” What they mean is that Jinling snacks are so delicious that they are ready to give up everything to eat them! As an epitome of Jiangsu cuisine, Huaiyang cuisine originated in the areas surrounding Huai’an and Yangzhou, and featured on the menu of the royal courts. Huaiyang cuisine became world renowned for being served at the very first state banquet at Beijing Hotel in celebration of the founding of the People’s Republic of China. Even today, most dishes served at state banquets can be identified as Huaiyang cuisine, so Huaiyang cuisine is also known as the national dish of China. 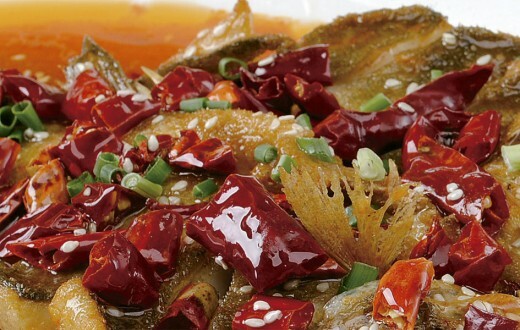 Situated in a region with more rivers and lakes than mountains, Huai’an and Yangzhou do not produce such delicacies as sea cucumber, abalone, edible bird’s nest or other wild foods. Despite this, the local people have used their ingenuity to make full use of local ingredients and, by employing intricate cooking techniques, have turned the common shrimps and crabs into widely recognized dishes and made Chinese yams and edible wild herbs feature on the menu of state banquets. 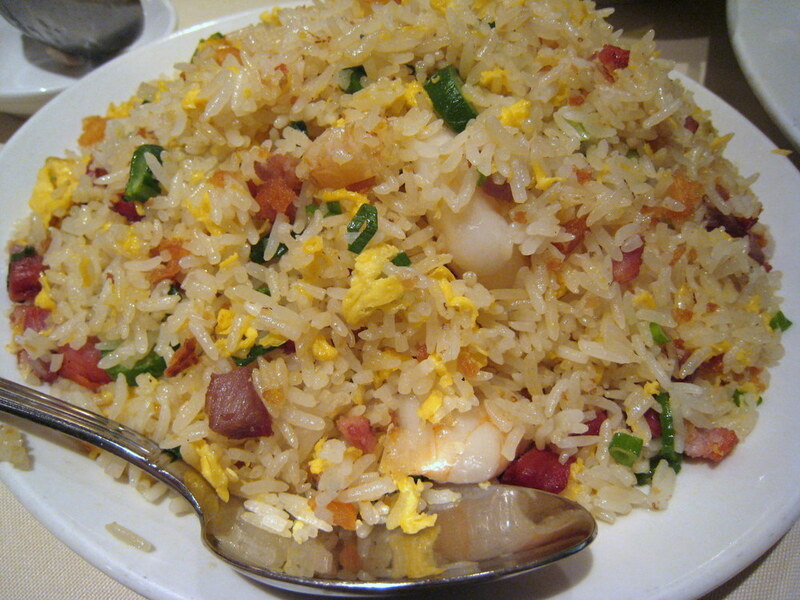 It is no exaggeration to say that Huaiyang cuisine is the most effective test of a chef’s competence. Long fish, or rice-field eel, a specialty of Huai’an, can grow to about one foot long and as thick as a finger. Amazingly, this small eel can be used to make an eel banquet in Huai’an, with as many as 108 dishes, in different flavours and all containing the eel. Located on the north bank of the Yangtze River and right next to the Beijing-Hangzhou Grand Canal, Huai’an and Yangzhou are at an important crossroad. This area has been renowned for its plentiful agricultural produce since antiquity, and its regional cuisine has evolved significantly, drawing on the strengths of schools of cooking from the north and south of China. The cuisine is known for its refined presentation, delicate knife skills, and light taste.  It focuses on the flavours of the ingredients with the aim of maintaining good health. 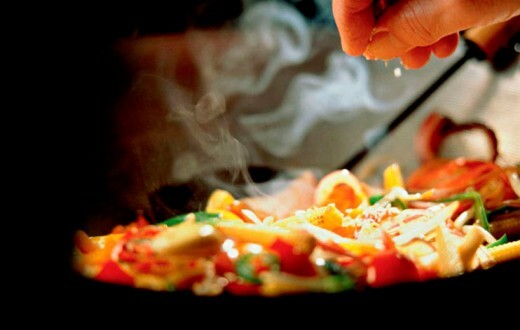 Huai’an and Yangzhou chefs excel in making delicacies using ordinary ingredients. The ingredients for Huaiyang cuisine are very common and easily available, so it is up to the chefs to maximise the flavour of the ingredients with their culinary skills. It is no exaggeration to say that Huaiyang cuisine is the most effective test of a chef’s competence. Long fish, or rice-field eel, a specialty of Huai’an, can grow to about one foot long and as thick as a finger. Amazingly, this small eel can be used to make an eel banquet in Huai’an, with as many as 108 dishes, in different flavours and all containing the eel. The care in the 58 use of ingredients and strict requirements for the skill of the chef both contribute to the prestige and popularity enjoyed by Huaiyang cuisine. It is no wonder that, in the Qing Dynasty, recommending good chefs, instead of giving gifts, was a common practice in Huai’an among officials, relatives or friends. 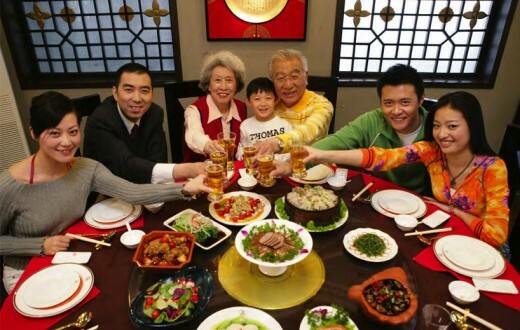 Huaiyang cuisine is fresh and natural, like a pretty girl of a small well-to-do family. 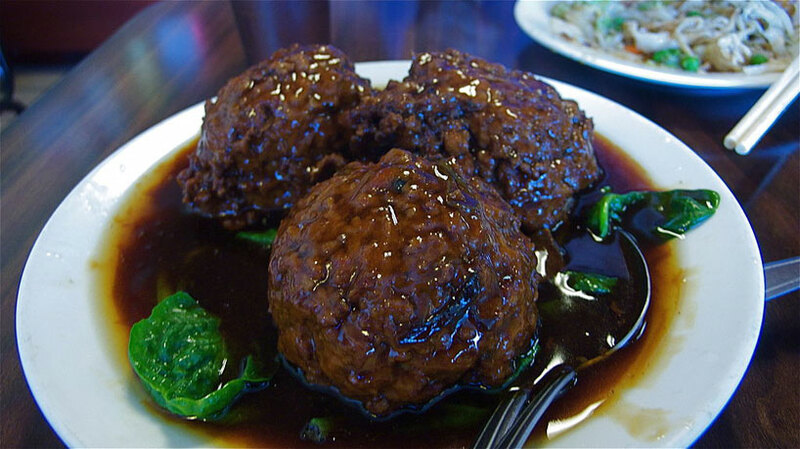 Of course, it also has some grand dishes, and a typical example is Crab-flavoured Lion’s Head-a large meatball. To prepare the meatball, pork and water chestnuts are finely diced into mince, and crab meat is then added The ingredients are mixed and rolled into a large meatball the size of a big apple. These meatballs are tender and smooth, rich but not greasy, and can be cooked in different ways: braising, steaming, quick-boiling and frying. Owing to their large size and round shape, they are known by their nickname Lion’s Head, and usually occupy a whole plate by its own. And, of course, smaller meat balls, the size of a pigeon egg, can also be made. These can be embellished by a roll in glutinous rice before steaming them. 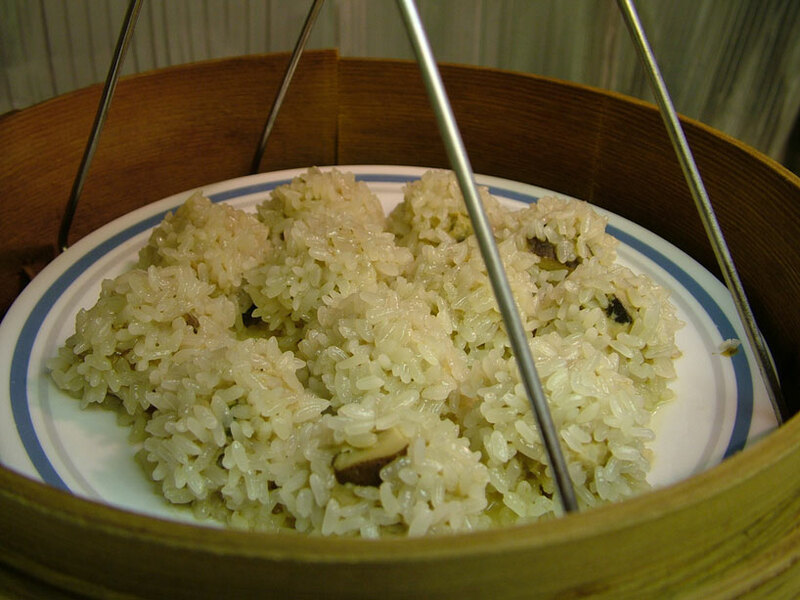 When they are served the rice is saturated with the aroma of the meat and appears translucent looking like a layer of pearls, as befitting its poetic name-Pearl Meatballs. Can you believe that a vegetarian ingredient can be cooked to taste like meat? Have a taste of shredded dried tofu in chicken soup, a dish that is very demanding on knife work-the shreds of dried-tofu are so thin that they can be pulled through the eye of a needle. The other ingredients of the soup are shredded chicken breast, shelled fresh shrimps and ham, depending on the season. The flavours of the different ingredients are brought together with chicken soup and are absorbed by the tofu. AB a result, each strand of tofu is delicious and refreshing in taste. AB a signature dish of Huaiyang cuisine, shredded dried-tofu in chicken soup looks ordinary, but brings surprise, admiration and gratitude to guests at the dinner table. This is perhaps the very philosophy of gourmet cuisine-bringing culture and tender feelings to the dinner table. In addition to the aforementioned Huaiyang cuisine, household banquets in Huai’an are also known for their distinctive styles. Since antiquity, Huai’an women have had to learn cooking skills at an early age and master several unique dishes so as to take good care of their own family when they start their own family. As a result, homemade dishes have gradually come to the fore and are in no way inferior to those prepared by court or restaurant chefs. Among all the homemade foods, my favourite is rice crust. During my childhood, rice was usually cooked in a large cauldron or pot on top of an earth stove. At the very moment the rice was ready, Grandma would always stuff some extra firewood into the stove to make the bottom layer of the cooked rice a little burnt. When the rice was taken out of the cauldron, a layer of aromatic rice crust would appear at the bottom. It would be left in the pot for about two minutes on a slow fire and cooking oil would be dropped along the rim of the rice crust. As the oil sizzled, the rice crust would separate from the cauldron and with a slight nudge, it would come out in the shape of a big straw hat. Grandma then would sprinkle a spoonful of white sugar on the crust, and the children would fight over the shiny, crisp, fragrant and sweet “big straw hat”, and soon it would be gone. None of them would show any interest in the bowls of rice. The ingredients of Huaiyang cuisine mainly consist of freshwater produce, poultry and ordinary vegetables. Whether cooked in a fancy restaurant or on top of a kitchen stove at home, these delicious dishes are easily accessible and are always refreshing with a hint of sweetness. Grandma was an ingenious cook and she often placed sesame seeds on the meatballs before frying them, making the meatballs even more delicious with the aroma and crispiness of the sesame. 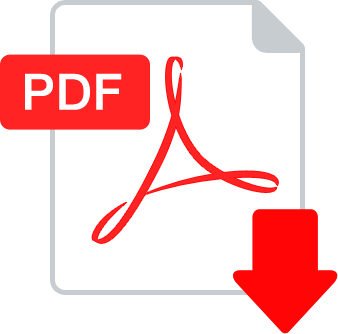 Sometimes, while stewing a pot of small fishes, she would paste a ring of dough along the inner edge of the pot, and the fish stew would splatter over the dough from time to time. When the fishes were cooked, the dough would become pancakes or pot-stickers, of which one side would be crispy and delicious, while the other side soft and glutinous after being saturated in the fish stew. In fact, the pancakes were even more delicious than the fish stew. This homemade dish is known as Small Fish with Pot-stickers. Cattails as tall as a man can easily be found along the river bank in the Chinese countryside. As they grow microphone-like spikes, they are also nicknamed ”water candles”. In early summer, if you pull out the cattails and peel them, you will be left with their white tender roots known as pucai. When cattail roots are stir-fried with dried shrimps, it be­ comes the famous dish Cattail Roots with Shrimps. Grandma liked to make a soup with cattail roots, adding some flour or tofu. The soup satisfied my small stomach and has kept my heart warm over the years. When dried, the cattails can be used to weave sandals, bags, mattresses, rain hats and capes. The dried cattail spikes, once lit, become natural mosquito-repellent incense. Playing with dried cattail spikes, the children would be safe from mosquitoes. So you see, every single part of this ingredient can either be eaten or used without any waste. That is how we should show our gratitude to the land that feeds and clothes us. The ingredients of Huaiyang cuisine mainly consist of freshwater produce, poultry and ordinary vegetables. Whether cooked in a fancy restaurant or on top of a kitchen stove at home, these delicious dishes are easily accessible and are always refreshing with a hint of sweetness. Huaiyang cuisine continues to innovate to this day, while its influence has spread afar. Crabs from Lake Hongze and crayfish from Xuyi County of Huai’an City have become popular across the whole of China. Small Fish with Pot-stickers can be found in China Towns abroad and even the National Huaiyang Cuisine Cultural Museum opened in the City of Huai’an. The list goes on. Perhaps, the reason why we reminisce about the flavours of food is that it has always been inextricably linked with culture.